Click here to access the Trivia Challenge entry form. 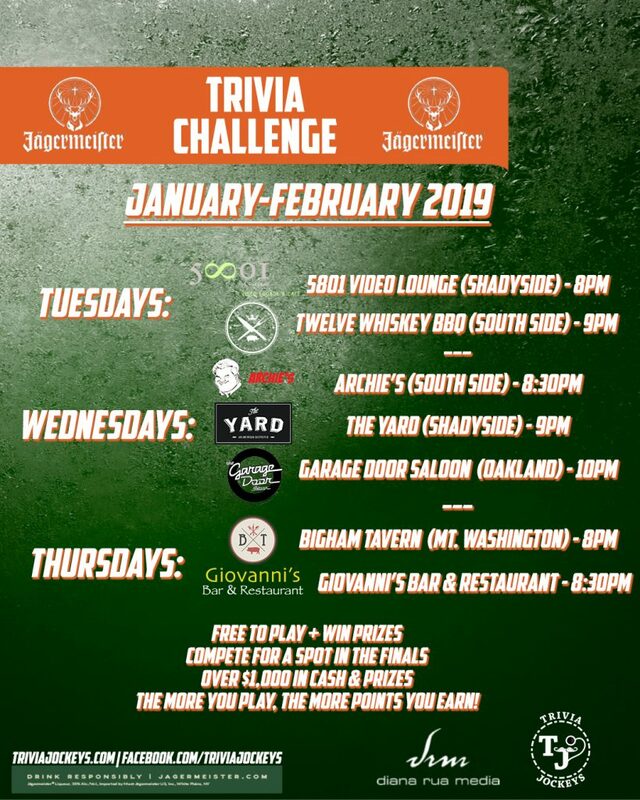 Trivia Challenge will last 8 weeks — qualifying rounds begin January 8th, 2019, and end February 28th, 2019. Top 32 overall teams with the most cumulative points will advance to the FINALS. Championship FINALS will occur Monday, March 4th, 2019. Each team must fill out the Trivia Challenge entry form located at: http://triviajockeys.com. Scores from each night will be tallied by Trivia Jockeys and loaded into the leaderboards located at http://win.triviajockeys.com. Advancement to the finals will depend on teams’ cumulative scores per venue, not overall. Your team name must remain the same if playing at different venues. Teams are limited to 5 members per team in qualifying rounds and the championship. For smaller teams that advance to the championship, feel free to staff your team with up to 5 people of your choosing. Due to size restrictions, winning teams must RSVP to finals to ensure seating is available. All normal Trivia Jockeys play rules apply. Trivia Jockeys decisions are final – be it omitting questions, restarting questions, changes to bonus point scoring, etc. The overall point system will be a cumulative score. All teams will receive 1 point just for attending. Championship round will consist of 32 teams. The top 3 teams from each location will advance to the championship. Cumulative overall scores will determine who fills the remaining spots.